Sure, it comprises aero tweaks, a little more power and quicker shifts, but the Lexus LFA Nürburgring Package is still the rarest among the already-rare LFAs, at only 50 units. Bragging rights, thy name is a cranky old German racetrack. The package, if you were unaware, celebrates the LFA's three class wins at the Nürburgring 24 Hours. New aero kit, as altered for more downforce at high speeds, includes a more copious front splitter, side canards and a larger rear wing. 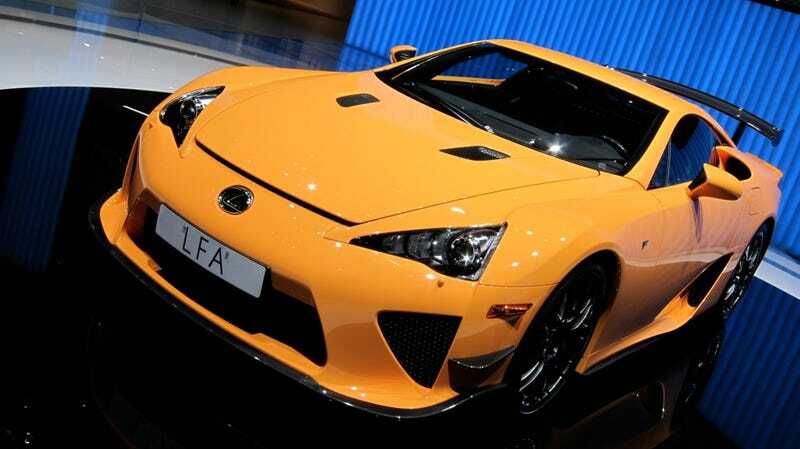 Ten extra horsepower have been squeezed from the V-10 to offset the additional drag, allowing the LFA's 3.7-second 0-60 time to remain untouched. Shift times have been quickened to 0.15 seconds, and the running gear's been lowered by 10mm. But what of the Nürburgring? Drivers get a free driving course there, as well as a one-year free pass. None too shabby.